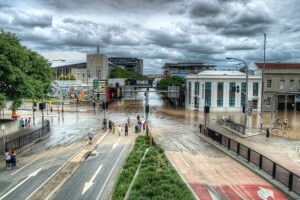 Brisbane photographer Ashton Welsh has raised almost $1000 to help flood-affected Queenslanders. He has put together a Fundraising Photo Book, giving 100 percent of profits from sales to the Premier’s Disaster Relief Program. Surrounded by suburbs submerged by flood waters in January, Ashton began his project after being turned away due to an overabundance of volunteers. “I am simply one individual citizen doing what they can to help the community recover after such a terrible disaster,” he said. With the help of a U.S. publishing company and local publicity through community radio station 4ZZZ, the amateur photographer has sold more than 100 books and raised hundreds more through other fundraising events. This book is filled with 40 pages of spectacular imagery of the flood devastation in and around Brisbane and it is certainly a little piece of history worth holding onto. “I really enjoyed the challenge and enjoyed giving back to the community in a unique way,” he said. Some of Ashton’s pictures are also on display at the Queensland Museum and the State Library. Premier Anna Bligh has praised the generosity of ordinary Australians who have donated to flood relief. The appeal has so far raised $259.45 million, with funds distributed to 27,700 households.